Friday December 26th 1884. The weather was more pleasant and Mother and Will went to the valley to spend the day. I helped with the work. We spent the evening at home. Saturday December 27th 1884. I was at home all the forenoon and rode to town with Will in the afternoon, he took Mother down to Halsons and then brought here up to Hatties where we all stayed till after supper and went to the rink to see them skate. Sunday December 28th 1884. Will and I went down to Aunt Libs to dinner and came home just at night in a rain storm. We had a good talk today about the past, present and future. We spent the evening in the parlor reading my old diary. 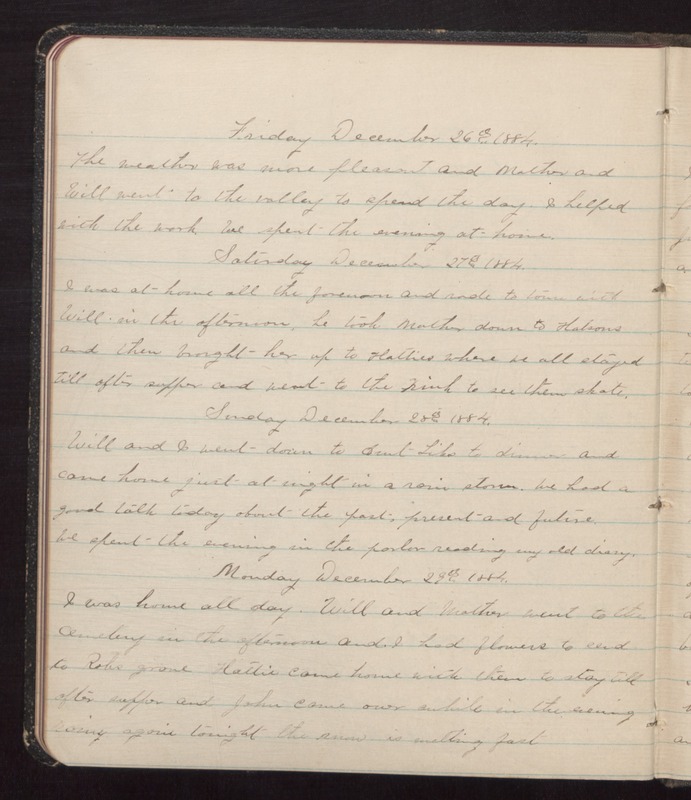 Monday December 29th 1884. I was home all day. Will and Mother went to the cemetery in the afternoon and I had flowers to send to Robs grave. Hattie came home with them to stay till after supper and John came over awhile in the evening. Rainy again tonight, the snow is melting fast.